The look of your cascading or medium length tresses is no longer pleasing. 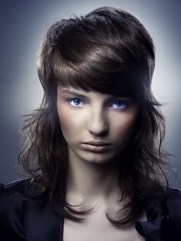 Then why not experiment with these stylish medium layered haircuts for a voguish appearance. Learn how to boost the volume and look of your strands with groovy layers. Medium length hair offers unlimited possibilities when it comes to creating a fab hairstyle. However, after a while, the length might not seem so flattering after all. The best way to add a new flair to your locks is to add bangs or layers. These two accessories are among the most sought-after styling techniques of the year. Find the best do for your face shape and personality. Ranging from the edgier to the more classic variations, don't scare away of improving your styling skills with a few tricks. Inspired by the stunning hairdo of celebrities, it's time to steal the show with a hot layered hairstyle. Copycat or, on the contrary, revolutionize their do with the basic hair styling tools and products. Test their efficiency by sporting the most breath-taking designs all throughout the year. Add definition to the choppy tips with a little gel or mousse. The secret to bring out the best of this method is to add volume to both your strands individually as well as to the overall hairstyle. Whether you opt for a symmetrical or, on the contrary, a more colorful and eye-popping hairstyle, the point is to emphasize the power of layers. Don't forget that this technique is not only about trimming and reducing density, it's rather volumizing and texturizing the strands. Bob or sedu, curly or ultra-sleek, layers should fit the personal taste of the wearer. Hairdressers have the role of providing the client with the hairdo that flatters the facial features and achieves the desired effect. Don't hesitate to skim through these stylish medium layered hairstyles to draw some inspiration for a future haircut. Steal the tricks to create a similar effect, even if the hair styling is done at home by a hairdressing rookie. A SoCal resident, FIDM graduate, savvy shopper who is passionate about sharing my ideas.